The mild and gentle Myrtle essential oil has an uplifting effect on the body and mind and is helpful when used in cases of addiction and self-destructive behaviour – it is said to cleanse the inner being and dissolve disharmony. It has an excellent healing effect on acne prone skin as it is bactericidal and antiseptic. The main chemical components are alpha-pinene, beta-pinene, limonene, cineole, alpha-terpinen-4-ol, myrtenol, geraniol, linalyl acetate, myrtenyl acetate and carvacrol. 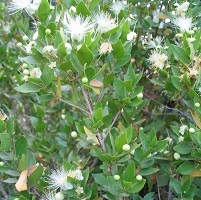 In vapor therapy Myrtle Essential Oil can be helpful with combating symptoms of addiction withdrawal and feelings of anger, greed, envy and fear. Using Myrtle essential oil in vapor therapy is also useful for the removal of bronchial cattarh and for other lung infections. Its gentle effect is said to be of great influence when treating lung complaints in chilgren and the elderly.